Yeah, but: It might be cool, but I'm secretly afraid that it's really dorky. The Long Version: Scooters are nothing new, but Xootr still came a little late to the party: the Razor had already dominated the market with its children's toys. This scooter is a completely different vehicle, made for adults and very high quality. Forget what you think you know about small-wheel transportation. The Xooter Mg is named for its one-piece magnesium deck - at least thats where the Mg comes from, there's really no explanation for the "Xootr" part. It rolls beautifully, can go forever down even mild grades, and does very well over sidewalks and roads alike. (Uphill and headwinds can be a challenge.) Larger bumps, curbs, and the occasional pothole are solved by just putting a foot down and 'stepping over' the obstruction. With reasonable effort I can keep up with slow bicycles and pass people on rollerblades. I've used a GPS to check my speed, and I'm most comfotrable moving at about 15-18 km/h. Over a typical distance scooting averages out to be twice as fast as walking, which is better than it sounds since it takes just as long for traffic lights to change and having a scooter just means that I spend more time waiting for them. An ideal scooter distance is between 1-5 kilometers. Anything shorter isn't really worth the time savings, and anything longer would be better served with a bike or public transit. It's possible to ride the scooter long distances - my personal best is 16KM - but it takes some training. I was surprised to learn that kicking isn't the hard part: it's the hundreds of up-and-down motions with the standing leg that accounts for most of the effort. The instructions say to alternate legs every so often, but I'm usually not very diligent and I'm more confident around potholes, people, and streetcar tracks when I can put my right foot down. The scooter is very quiet, unlike a skateboard which gives pedestrians fifteen minutes' notice, so expect to startle people and behave accordingly. It's worth noting that the Xootr Mg is a lousy cargo vehicle. Any bag carried in the hand or on the handlebars will swing wildly and hit the steering column. It is also nearly impossible to ride with only one hand on the bar. This means that anything carried for moderate distances or at a normal speed needs to be worn in a secure sling pack or backpack, which means added weight for all of those hundreds of step-up exercises. This isn't the end of the world, and I typically carry an extra five or ten pounds of stuff without problems, but it's not like a bike with a rack and panniers. For quick trips close to home, I can make it the few hundred metres from Cora's Pizza or the local convenience store with something in my hand, but it's slow and awkward. And no, even I wouldn't put a basket on the front. That would look dorky. I highly recommend the carrying strap that you see on the front of mine. The real advantage of a scooter over a bike or rollerblades is how easily it goes away when you don't need it any more. Bikes need to be parked and locked, and are always at risk of being stolen. Rollerblades (sorry, "in-line skates") usually can't be worn indoors, meaning that spare shoes need to be carried and used. But it's a ten-second job to fold the scooter - it can be done while walking - and then the strap lets me carry it slung with no effort at all. It's a little bulky for narrow shopping aisles, but easy to walk with when I'm coming home loaded with groceries. Xootr also sells a fender. I had it installed at one point, but took it off because I couldn't make it stop clanking every time I hit a bump larger than a crack in the asphalt. The brakes disappear when the wheels get wet, so it's not that much of a sacrifice, and I don't miss the 'rear brake'. For safety at night I've added a front light and a lot of black reflector tape. My two complaints, besides the fender, is that there's occasionally a creaking when the deck flexes, and that after a couple of years of light use the pin that holds the folding hinge in place has stopped working properly. It's a neat design with a spring-plunger to lock and unlock it, but it's stopped springing back, and no amount of WD40 or persuasion has helped. I've ordered a replacement - $12 with shipping - and have been using my keys to pop the locking mechanism back into place until it arrives. Not a big deal, and I'm happily using it for my commute to work and any solo trips around the neighbourhood. It's nearly impossible to not smile while riding this scooter. It's the same kind of feeling as when I had my first bike: freedom and speed for no effort. If something tragic happened to my Xootr, I'd buy a new one immediately - especially now that they're making the decks in different colours. But wait, there's more! A second installment of my Xootr MG review is on-line. Six months and five hundred kilometers later, how did it hold up? Find out now! And there's still more! I've also bought the Xootr Swift bike, and its review is also on-line. Read it here! cool review. i am looking at getting a xootr myself, but i can't decide between the mg and the roma. have you tried the roma? It wasn't me, sorry -- but I'd certainly be happy to let someone try mine out. (As long as I'm not on my way to work with my usual razor-thin margin to get there on time.) I have seen a couple of other people with the Mg, and one with the wooden-decked Cruz, but never while I was on mine. I've never seen the Roma, but Xootr does point out the advantage of the Mg: lowest deck height but still with decent ground clearance, and the one-piece deck doesn't creak the way the two-part ones can. The advantage of the Roma is supposed to be its narrower deck for more natural movement, but I've never really had a problem with the width of the deck on the Mg. Ten seconds on a xootr is usually enough -- they are a lot of fun. Nice review, Here's how one guy put a basket on his Xootr - not sure if it can still be folded easily with the basket off. I use my MG with the train here in Boston, and love it. Thanks, that's a great link. I've added it to the main review. Nice review. I contacted Steve from Xootr and learned that they sometimes get returns through their 30 day money back guarantee which they sell as factory refurbished. I was lucky enough to call the day they got an Mg in and bought it on the spot over the phone. Xootr seems like a great cross-border seller. They take a hit on the shipping to Canada to offset UPS' brokering fee. Anyone interested in getting a refurb at a substantial savings should contact Xootr to get on their email refurb alert list. They will contact everyone on their list at the same time if one comes in and it's first come first serve from there. reading your review makes me want to get a xootr even more! will be using it in TO to get to union stn through and from work since i will coming in from the GO. I have a Xootr Mg that I've had for about 10 months now; I bought my husband a Xootr Cruz for Christmas because he was always stealing mine! I've always been jealous of my kids riding their Razors all over town. I sometimes would scoot with them by taking over my son's scooter (heavy duty Razor). Then I spotted an older couple sightseeing on Xootrs in Chicago while out with my kids on their Razors. It was love at first sight. I was so impressed with how beautiful and how well proportioned they were for full sized adults. I was also surprised at how this couple (in their 70s) left my kids in the dust! They were nice enough to give me info. while we all waited for a stoplight. I begged my hubby to get me one for my birthday. The rest is history. I'm an avid bicyclist, but there are times when I can't bring my bike. I can take my Xootr on the train at all times (unlike my bike which can only travel during off-peak hours). It is fantastic for city commuting in Chicago. I have no problems dealing with sidewalks, streets, etc. I added a small incredibell to deal with the problem of oblivious pedestrians. In my suburb, the sidewalks are old and I actually get better speed on the streets, so that's where I do most of my riding. I use a Cateye Opticube light for night riding. This is my back up bike light and it can clip on to any handlebar in a matter of seconds. I don't leave it on the scooter unless I know I will be doing night riding. It's handy to have something to illuminate the sidewalks or streets to avoid potholes or puddles. I also have the fender which I like a lot. It helps keep down road grime and functions as friction brake when backup stopping is needed. You can hang regular grocery bags on the 'horns' or you can use bike panniers. It's much cooler than anything else I've seen out there and it works well. It does change the stability a bit when you have a heavy load, so be sure to keep a foot on the platform at stops or you will tip. 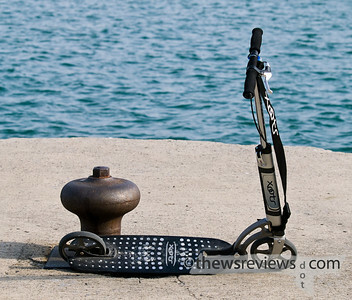 It also makes the scooter more bulky when folded, but it has a quick release feature that allows you to remove it easily. We are planning a trip to San Diego in April and plan on bringing all our scooters to aid in transiting around the city. My kids are sooo jealous of our Xootrs but I just can't find the funds to get five of these things. FYI: like another poster here, I frequently ride with my 5 yr old daughter on the front. Finally, a warning caveat: make sure that test drivers understand that the scooter can go FAST, and that the brake is not perfect. My sister took my Mg out for a spin and ended up crashing when trying to avoid some local kids on the sidewalk. She didn't realize that the front brake would flip her at high speeds and ended up breaking her wrist! Thanks for this review! I'm seriously looking at getting one of these. I live in Toronto too and think it's a much more versatile mode of transport than a bulky bike that could get stolen. I will let you know my comments if/when I get the Xootr. I love my Xootr mg. It feels quiet to ride. The ride is hard with lots of micro vibrations felt on fine textured outdoor concrete and the mg model does sound clangly when pushing it unloaded. It has light carrying capacity - ie backpack on rider plus single bag with handles hung over both handles reduces the swinging about; or if you buy something big and heavy you can place it on the platform and wheel it rather than ride it. I put the mg into a shopping trolley when shopping. The brakes are weak especially when new but become better when the brake pad wears into a concave wheel hugging shape. The build quality is amazing - I've had lots of comments from people I don't know approach me and ask where I got it - but of course I keep my one new and shiny to do that - it's easy to keep clean - a squirt of car wash on a soft broom and a light hose to rinse off. I put little thumb nail size bicycle lights on mine which aren't that bright but adequate and are small and light. I have chipped the paint underneath but use touch up paint to cover it up. The Made in USA sticker made of paper is wearing off - I wish they would plastic coat that. It rolls really well - on a slight incline I can easily go a whole long block with a single push and it feels like it is electrically powered because of how far it can go and quietly. In reality only sections of your ride will be like this with the rest like you would expect with pushing. In terms of effort it is probably a little lighter than a bicylce because it is lighter uphill and I walk it up steep hills - it will take longer because you go slower than a bike (I ride it at safe speeds - it can be dangerous because it can go fast particularly down steep hills - going down hill I brake from the beginning to stop it building up speed). The vibrations you feel on the road will tire you out and limit how far you ride and vibration supression (ie some form or suspension like a rubber inser) and if they could fix that clang - However the performance of the wheels or rolling resistance/comfort compromise is excellent. It is like a Rolls Royce in two ways - it has excellent build quality; and two it's engine (ie. it's wheels) is superb. It is expensive for a scooter but having bought it and used it, it isn't that pricey for what you get and if anything happens to my one I would easily go out and buy another one to replace it. I am tempted to get a Xootr Street and have two Xootrs but have to hold myself back from buying one. Wow, thanks for the great comment. I really appreciate the additional information and different points of view. Wow! I cant wait to get it!!! ive been inlove with it for the last 2 1/2 years!! i dont live in the states so i had to wait, but finally in 15 days im going back so im finally getting it!! !....however i cant still makeup my mind i like the cruz and the street........I live in Mexico City by the way......Cheers! You've convinced me to get a Xootr! I have one question though - the Xootr website says that in some cases it might be cheaper to use UPS International service rather than UPS Ground Shipping, to avoid entry preparation fees. Is that the way to go? I live in Toronto. Thanks! Xootr is watching out for you. Just in case the link changes, use your favourite search engine on the words "ups fees to canada". Their standard service has some pretty hefty fees, making it the most expensive of their options no matter what their rates say. And I've been seeing a lot of scooters around Toronto, so you'll be in good company. Nice reviews (plus your others!). Good to see I'm not the only function and form obsessed 'nutcase' out there. A quick question. I'm looking to buy a Xootr, but can't decide between the Street and the Roma. You mentioned that if there was a reason for a new Xootr you'd go for a Roma instead of a new MG. What do you think the pros and cons of a wider / narrower deck are? That's a good question. I hadn't actually seen a Roma in person when I said that, but I did get a chance to see one (folded) in New York City recently. I have to say that it's a very good-looking scooter, but it didn't help me choose my next one. As I see it, the biggest difference between the wide and the narrow deck comes down to riding versus transporting the scooter. When I ride, the wider deck of the Mg is nice to have, but not essential. I will sometimes rest with both feet on it when rolling down a slope. When I'm carrying the Mg, or sitting with it on the subway, the wide deck takes up more room - but not a huge amount more than the slightly narrower Roma would. The advantage to either one is slight, but the tradeoffs aren't that great either. That makes for a tough choice. The Street and Roma are both attractive machines with slightly different aesthetics. Personally, I say get whichever one you like the look of the best. It's possible to over-think things; both are going to be great no matter which one you buy. So while it's a tough call, at least there's no bad choice. If you can stop by again, I'd love to hear what you decide and what you think of your new ride. We can always use more information and different perspectives. I think a lot of people are trying to make the same decision that you are.